A major Pharmaceutical plant was having trouble servicing their globe control valves and was looking for an alternative. Process engineers needed to achieve precision control of liquid ingredients in their drug processing lines without incurring the high cost of typical globe control valves. Globe control valves have a high initial cost as well as a high maintenance cost, as they often need to be returned to the manufacturer for maintenance which can often result in periods of line shut downs and subsequent revenue loss. Assured Automation introduced the V Series V Port ball valve line to the end user. The low initial cost of the V port ball valve package compared to globe valves was very attractive. The ease of maintenance sold the plant engineers on the package. Actuators and positioners could be readily removed with 4 bolts. Plant maintenance was confident they could easily troubleshoot problems with this valve package, their process lines could be up and running in a matter of minutes, not days. The Plant engineer installed the V Series V slotted ball valves and was impressed with the precision control they achieved with the V shaped ball. The package was as easy to maintain as any automated ball valve in the plant. They have now standardized on the V Series for many of their process lines that require precision control. The V Series ball valve provides accurate control of flow rates, from simple on-off to modulation control applications. The throttling part of the valve is a solid stainless steel ball, not a seat insert like others. The unique V Series ball design is forgiving, accommodating, and characterized to meet all custom flow requirements. Assured Automation offers a unique V Series Online Valve Configurator that makes it quick and easy to build, price, quote and order valve assemblies online. 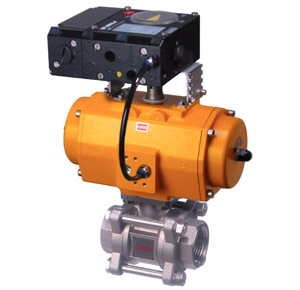 Assured Automation’s V Series Valves have also been used successfully in applications for controlling pressure, discharge temperatures, maintaining tank levels and regulating heat jacket temperatures. The V Series is part of our complete range of valves and flow meters, engineered and manufactured to strict quality, performance and dimensional standards. This entry was posted in Latest News, Pharmaceutical and tagged 2-Way Ball Valves, v port ball valve, v port ball valves. Bookmark the permalink.